If 2013 was the year of the selfie, then 2014 might be the year we take those pictures to a whole new level. 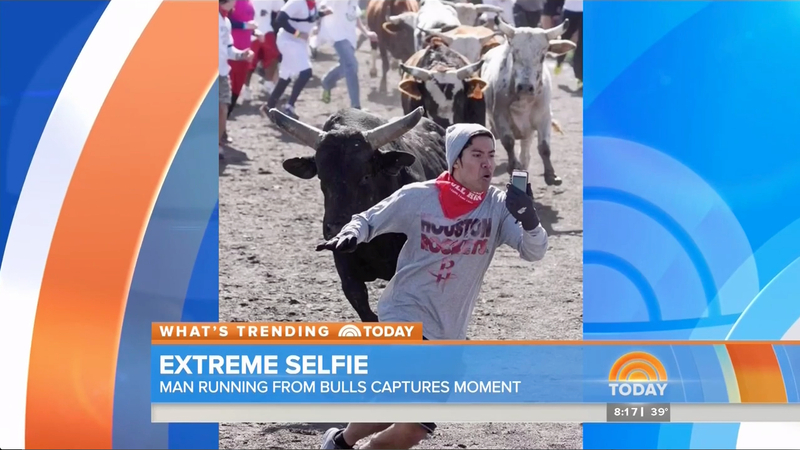 'TODAY' reported that one daredevil is literally grabbing the selfie trend by the horns, risking his life to take a crazy photo during a bull run. Yes, with a line of angry creatures behind him ... Christian Plaing decided the time was right to take a quick pic. If it looks scary, that's because it was -- and the video he filmed during the Great Bull Run in Baytown, Texas is proof. In it, you can hear him screaming as he runs for his life. On its website, the Great Bull run promises participants the 'experience and rush of a lifetime,' sprinting down a 400 meter track, running away from 24 bulls weighing nearly 1,500 pounds. According to the Houston Chronicle, 3,500 people experienced that rush this year. The idea is pretty basic: don't get trampled. It looks like our selfie thrill-seeker decided to run.